This Rifle was made and manufactured in Ukraine by a company called zbroia, It is a Bullpup design ith an adjustable cheek piece. The calibre of the rifle is 4.5mm (.177) pellet. This rifle has built in regulator, which increases the shot to shot consistency.The main feature of the reservoir is the built-in regulator The fully filled reservoir is enough for more then 100 shots in 177. This rifle has a side lever action that is smooth and reliable and is better placed on a bullpup than a standard bolt as the action is further back than on a sporter rifle. The reservoir is removable with a quick twist and it can be uninstalled and installed with relative ease. The Kozak can hold 12 pellets in the chamber and comes complete with 2 magazines. 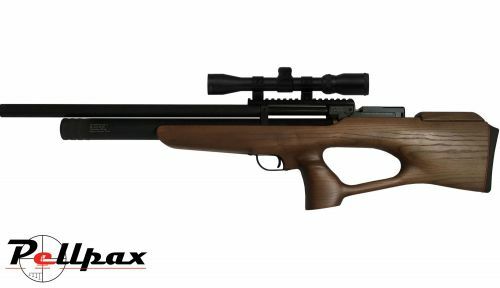 This rifle also comes equipped with an extended, match grade Lothar Walther barrel that makes this rifle incredibly accurate and consistent.